Here's the bad news, most if not all the wine you have starts deteriorating 2 to 4 years after it is bottled. If you've bought wine and you're saving it for a special occasion, most likely it will taste worse the longer you keep it. The good news is that if you have a lot of wine you're storing up, its time to start drinking! Jancis Robinson (one of the worlds most respected experts on wine) says, "Perhaps the top 10 percent of all reds and five per cent of all whites (and those are generous estimates) will be more pleasurable and more interesting to drink when they are five years old than at one year old." (I've heard others state its even higher than that.) So, the vast majority of wine is meant to be drank right away. But there are several unanswered questions. How do you know when a wine is worth aging? And why would someone want to go through the trouble of keeping a wine around for the long term in the first place? What actually happens to a wine when it is aged? And what makes all the trouble of storing a wine for several years worth it? Why go through all the trouble of aging a wine? Wine chemistry is very complex. As a wine ages all it's compounds interact with each other and become more nuanced, develop additional flavors and qualities over time. The most intense flavors in a wine mellow and become more refined, letting the more subtle flavors emerge. The result is a wine with extra flavor dimension. This can be quite mind blowing and is why people go through all the trouble to store and fight back the temptation to drink the wine right away. How do you know when a wine is worth aging? Say your child was born in 2010. You want to buy her a nice bottle of wine now, then give it to her on her 21st birthday in 2031. How do you know what to pick? 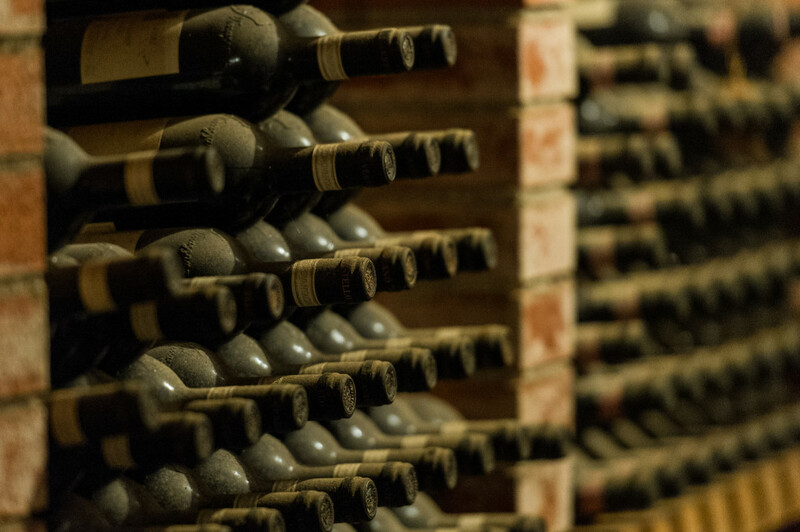 There are several factors that make wines age-able. Namely Tannins, Acid, and Fruit. The Tannins and Acids act as preservatives and the Fruit flavors give the raw materials which give it its unique flavor qualities. When wines have high levels of those three aspects then they tend to have greater age-ability. "What are Tannins," you ask? Tannins are a combination of several different phenolic compounds present in wines. When you taste a wine with lots of tannins you get a mouth-drying sensation. Wines with high tannins can also create a sense of bitterness and roughness. Common grape types (varietals) with high levels of tannins the ones that contain Cabernet Sauvignon, Merlot, Granache/Garnacha, Nebbiolo, Pinot Noir, Sangiovese, Syrah/Shiraz, Tempranillo, and Zinfandel. If you are familiar with any of these types of grapes you'll notice that they are all used for Red wines. It should be noted that aging wine in oak barrels imparts some additional tannins to the wine. Wines with high acidity have an effect of mouth watering or tartness. White wines are generally the wines which have high acidity. White wines are made with very little contact with the grape skins (which is where most of the tannins in a wine come from) so there are very little tannins in white wine. 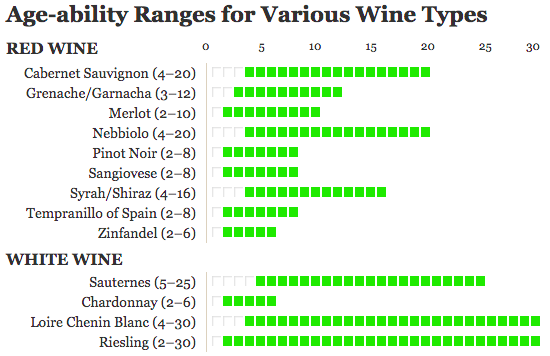 The common grape types (varietals) which give high acidity are Chardonnay, Chenin Blanc, Riesling, and some Semillon. How much fruit that goes into a wine is a factor (in its simplest form) of the ratio of fruit to water. When wine growers are attempting to grow higher quality grapes they put great effort and attention into purposefully stressing the grapes. When grapes go through this careful stressing process they have more intense flavors because the vines have had to work much harder to produce the grapes and focus more energy into the grapes they do produce. They do this by carefully restricting the amount of water, very selective pruning, hand harvesting, selecting only the best grape bunches, or even in the most highest quality grapes hand selecting each individual grape.With cheaper wines much less attention to detail and effort is put into growing the grapes. In the cheapest wines they are just going for the biggest juiciest grapes they can grow and as many of them as they can. But, as you can imagine, these grapes end up being weak tasting and don't have the necessary levels of Fruit, Acid, and Tannins necessary to make a wine that can age. Plus the vast majority of grapes grown just haven't had the time and effort put into them. And much of the wine production process is just automated without the careful selection of only the best grapes. What wines can I buy which do age well? Back to the question about buying your daughter a wine for her 21st birthday in 2031. You are going to want to look at any of the wine types above with at least 10 years. If a given specific wine takes 10 years to get to its optimal drinking window, that optimal window usually lasts for another 10 years. The chart above shows the general time ranges when a given type of wine will begin to be in it's optimal drinking window. But each specific wine will vary from winery to winery. There are a few less known obscure wine types which are also age-able. At the end of the day you have to take it wine by wine. That being said, we are happy to help. Feel free to drop us a line. We're happy to answer any questions or help you find a wine that's just what you're looking for.